A man from Cardiff has been jailed for four years after admitting inciting violent disorder on Facebook during riots in England. 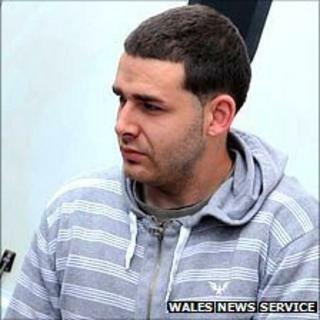 Jamie Counsel, 25, set up a page called Bring the Riots to Cardiff, later changed to Bring the Riots to Swansea. The sentence should be a warning that anyone using modern media to incite riots would face stiff punishment, said the judge at Cardiff Crown Court. Nicholas Cooke QC said the terror caused by the riots was incalculable. The court heard that he created the page on 9 August as rioting hit London and other cities such as Birmingham and Bristol. Daniel Webster, prosecuting, said Counsel's page had specified a time and location for the violent disorder to take place. Initially, 36 people joined the page, with one writing about plans to target the House of Fraser store in Cardiff. The posting read: "We're hitting Howells [the former name of the store] first." References were also made by others to the electrical chain store Comet, which had been targeted by rioters in other cities. A further 35 people joined the page when it was renamed to refer to Swansea. Counsel wrote about riots, looting, robbery and burglary. He was arrested after concerned members of the public contacted the police and was arrested on 10 August at about the time he had stated the riot should happen. Mr Webster said: "This was more than simply an open forum; this was a time and date for assembly." Sentencing him to four years, minus 96 days spent on remand, Mr Cooke told Counsel: "The violent disorder cost vast sums of money... the terror to the public is incalculable." The court heard Counsel had previous convictions for public order offences and criminal damage going back 10 years. In August 2007 he was part of a gang who attacked two men in Cardiff city centre. One was kicked unconscious in an unprovoked attack. Counsel was subsequently sentenced to two years in a young offenders' institution. In June 2009 he was found in possession of a lock knife in the footwell of a car. Ruth Smith, defending, said Counsel did not attend the planned riot. He accepted he was the author of the page and did not try to hide his involvement. Ms Smith said Counsel's upbringing had been difficult. He had suffered from ADHD (Attention Deficit Hyperactivity Disorder) and was being referred for treatment of mental health difficulties. "He has made considerable efforts against the odds, but his own foolishness has put that in jeopardy," said Ms Smith. She said he wrote a letter more than 14 pages long in mitigation. In it, he said he did not know anyone had been killed in the riots at the time he set up the Facebook page.